We offer a variety of day trips, concentrating on the beautiful county of Dorset but venturing further afield where the journey is worth-while. For Cruise Ship passengers we visit the best sights of Dorset and the Jurassic Coast. Each trip will have lots of stops for guests to get out, look around, hear some local tales and sometimes have the opportunity to go for a more extended walk. 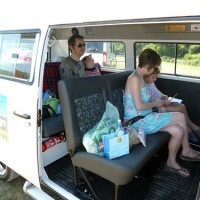 If you can’t see the perfect trip for you, why not hire the whole camper for a private tour! Please read the important trip information and things to bring below. Jurassic Ale Trail "Spritzer Special"
Please note that circumstances might force the order or content of a trip to change, but we’ll still make sure you have a great day out! Kids are welcome on all our trips as long as they are accompanied (by an adult), and we can provide booster seats for up to 4 children over the age of 3 – PLEASE NOTE however that we cannot accommodate any pushchairs on the Dorset Day Trips vehicle – there just isn’t room and the terrain at many of our stops is not pushchair-friendly. Unfortunately we cannot usually provide for under-3s and the nature of the tours means they’re better suited to older children over 6 years. Under-12s will be given a kids’ goodie bag rather than the adult one. Please also note that our vehicle has lap belts on the seats that kids will use, not 3-point belts. Unfortunately, we’re afraid we can’t take dogs or any other pets on the trips, unless they are registered guide dogs. Some of our trips visit places where, if sufficient time is available, guests may be able to enter properties owned by the National Trust (eg Corfe Castle, Hardy’s Cottage and Max Gate). The entrance fee to these properties is not included in the booking fee for these trips, though members of the Trust may enter for free. For info, at the time of writing, the standard entrance fees for these are: Corfe Castle £8 (£4 child); Hardy’s Cottage: £6 (£3.50 child); Max Gate £6 (£3 child). Please note that the consumption of alcohol and hot drinks on board the Dorset Day Trips vehicle is not allowed. will be ideal, but flip-flops (that’s thongs if you’re Australian or American) or high heels won’t be! A camera for all the fantastic sights you’ll see! And please don’t forget to bring any medication you may need (prescriptions or allergy reliefs, etc). Please see Terms and Conditions for more detail.